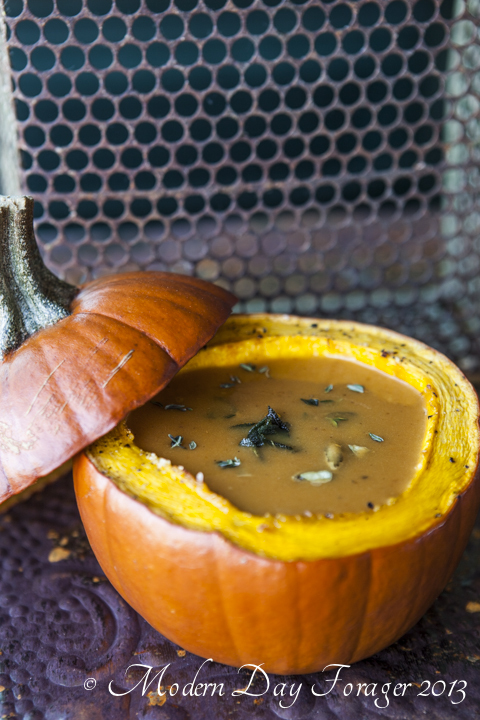 MDF’s take on a creamy, velvety pumpkin bowl soup with crispy sage! This soup will be sure to satisfy your winter cravings. The perfect bowl of comfort, this warming soup is also a real crowd-pleaser. As you know, we like to mix things up at MDF so we added Granny Smith apples for an underlieing tartness which adds freshness and cuts the richness of the pumpkin. I am a soup gal, always have been and love soup for breakfast, lunch or dinner with a crusty loaf of hot bread. I grew up in a house of soup artisans, there was always a pot of simmering goodness on the stove. The smell filled our kitchen and was truly intoxicating . If I wanted soup for breakfast my mom or grandmother were happy to oblige, going to school with a full belly of warm soup was just as good as a belly full of a hearty breakfast. I have followed this tradition with my kids, they love the option of having soup for breakfast. Enjoy this recipe it so easy to prepare and freezes beautifully. Place pumpkin quarters on a baking sheet, drizzle with olive oil, season with salt and pepper. Roast until tender but not falling apart, approximately 45 minutes. Let cool, peel away meat, and cut into small dice. In a medium to large stockpot over medium heat, melt butter and sauté onion, carrot, apple, roasted pumpkin, and sage until tender, approximately 8 to 10 minutes. Return the puree to the stockpot, add the chicken stock and spices and simmer for 15 minutes. Fry fresh sage leaves in olive oil in a small saucepan until rise to the top of oil and become crispy. Garnish with crispy sage, roasted pepitas, and fresh thyme leaves.